What are “Potholes” and how are organisms able to live in them? 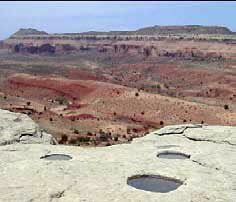 Small, circular potholes occur along the edge of a mesa above Bartlett Wash, Grand County, Utah. These pools are in the Jurassic Moab Member of the Curtis Formation. 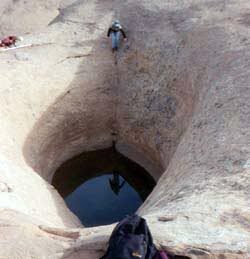 Potholes, which are depressions eroded in bedrock, are common in southern Utah. Also referred to as weathering pits, tanks, tinajas, and waterpockets, some of Utah’s best examples are in aptly named places like the Waterpocket Fold at Capitol Reef National Park; Pothole Point in Canyonlands National Park; Swiss Cheese Ridge near Moab; and Cookie Jar Butte, a peninsula on Lake Powell. Potholes are usually not a part of an active drainage; rather, they often form on flat or slightly dipping bedrock, typically sandstone surfaces, and huge potholes can form atop knolls, domes, and fins, and along the edges of mesas. Acting as rain gauges, they capture water directly from precipitation. Potholes range in size from a few inches across to large cavities more than 50 feet deep that contain hundreds of gallons of water. Their enlargement is slow on the human timescale, but over longer periods of time the complex interactions of rock, water, and life gradually increase the dimensions of these hollows. Weathering and erosion of potholes results, at least in part, from biological activity. Quartz sandstone is ordinarily resistant to moisture- induced chemical changes but can be more rapidly altered through “geomicrobiologic” processes. Some species of bacteria are capable of “consuming” siliceous minerals, and plants such as diatoms then sequester the silicon and other elements put into solution. When pools dry up, diatom skeletons, organics, and other fine particles are subsequently carried out of the pothole by winds. The sandstone basins are also “sealed” by mats of cyanobacteria, fungi, algae, and fine sediment. This surface “biofilm,” along with subsurface “endolithic” cyanobacteria (within-rock organisms), prevents water from soaking into the otherwise porous sandstone. Organisms on and within the rock represent a “weathering front” wherein water is retained, and along which the pothole is enlarged by a combination of biological and physical means. There is an amazing diversity of life in pothole pools. Although some species are geographically widespread, many are rare, narrowly endemic to certain locations, or unique only to these rock pools. Transitory or ephemeral waters like potholes are ancient environments inhabited by ancient organisms. Many species have survived to the modern day only because these rain-filled pools are available. The pools are free of many predators such as fish and some aquatic insects found in permanent waters like oceans, lakes, ponds, or tidal pools. Animals of pothole pools appear to have remained basically unchanged over the course of hundreds of millions of years, having fossil records dating from the Mesozoic Era and earlier. Accordingly, they are described as “Mesozoic lifeboat niches” for organisms that have not survived in other habitats, but who have found continuing sanctuary in potholes through geologic time. The trade-off of using pothole pools as a refuge is that organisms must be able to endure great and rapid changes in water temperature, pH, oxygen and carbon dioxide concentration, and ion concentration. Perhaps most significantly, they must endure the periodic drying of the pool. Additionally, pools can freeze solid in winter, effectively eliminating the availability of liquid water. Species must also overcome such ecological dynamics as overcrowding, predation, and competition for resources. Yet it is these extreme conditions that have allowed for unusual biological niches to open, niches that are occupied by strange creatures that posses extraordinary capabilities for survival in such a severe aquatic environment. Glad You Asked: What are “Potholes”?